We popped out of the tent, made breakfast and packed up. 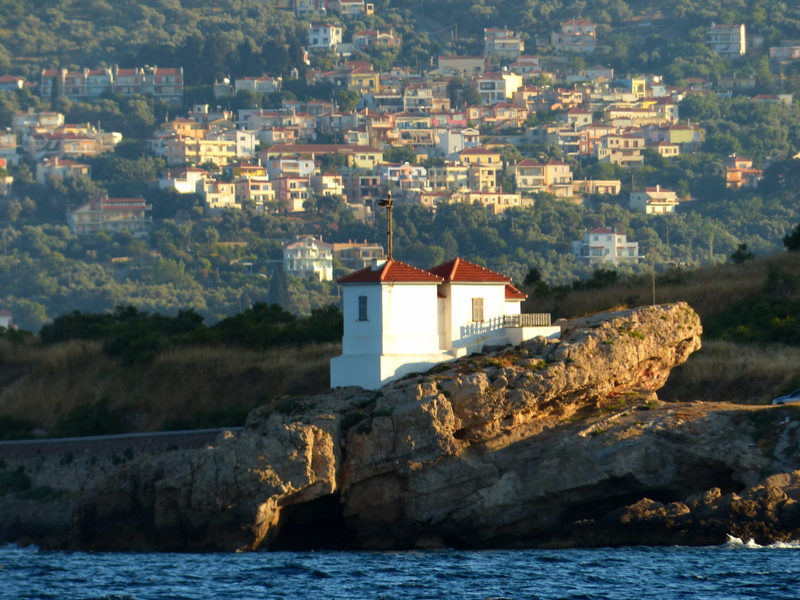 We did some final internet work and found that if we aligned things perfectly we could take the ferry to Lesvos then hop on the ferry to Athens immediately. 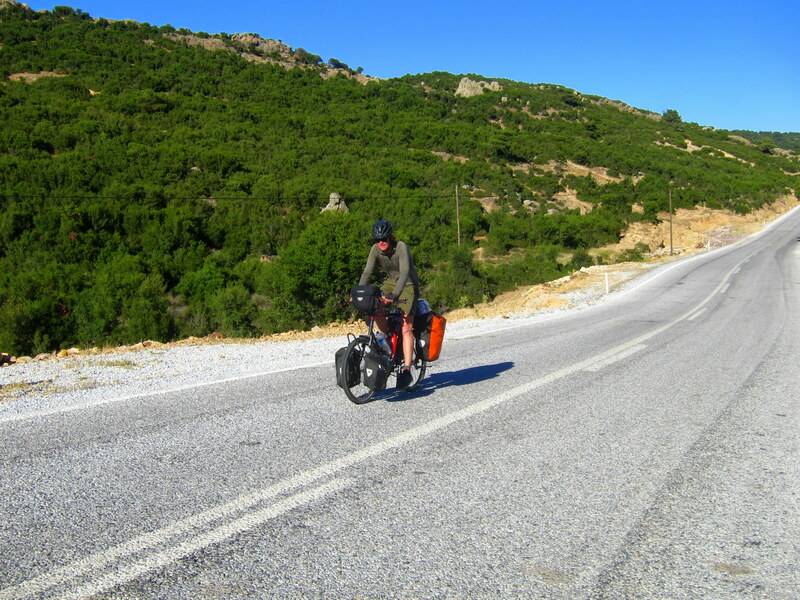 We had read a little about cycling Lesvos, and it sounded nice, but riding around in circles seemed a little pointless to us considering we have a long road ahead of us to the Netherlands. There was some confusion over who to pay at the campsite so we ended up having to wait until afternoon when the “trusted staff” showed up. We sat around chatting with the Latvians until then. It should have been a quick and mindless ride to the ferry, but the highway was being seriously worked on so we ended up in the travel lane with a bunch of trucks which made things unpleasant. We opted to take the small coastal road which seemed to follow the coast, but ended up being a 10%± roller coaster ride of misery (there was crying). Some sweaty miles later, we hooked back up with the smugly moderate grade highway and bought some ice cream to cheer ourselves up. A while later we made it to the port town where we stopped at the Kipa, which is kind of a Turkish Fred Meyers. We finally found 50 SPF sunscreen on sale and proceeded to buy in bulk. After some halfhearted negotiation at the port (I was able to knock 20 Euros off the price with way less effort than it took to knock 10 rupees off anything in India) we found ourselves bound for Greece. Ferries sound interesting in principle, but it was a pretty boring ride over to Lesvos. Since we had bikes and were non EU types, we ended up at the very back of the line going through customs. There was no chance that we were going to make the ferry to Athens after waiting in customs, so it was time for plan B. 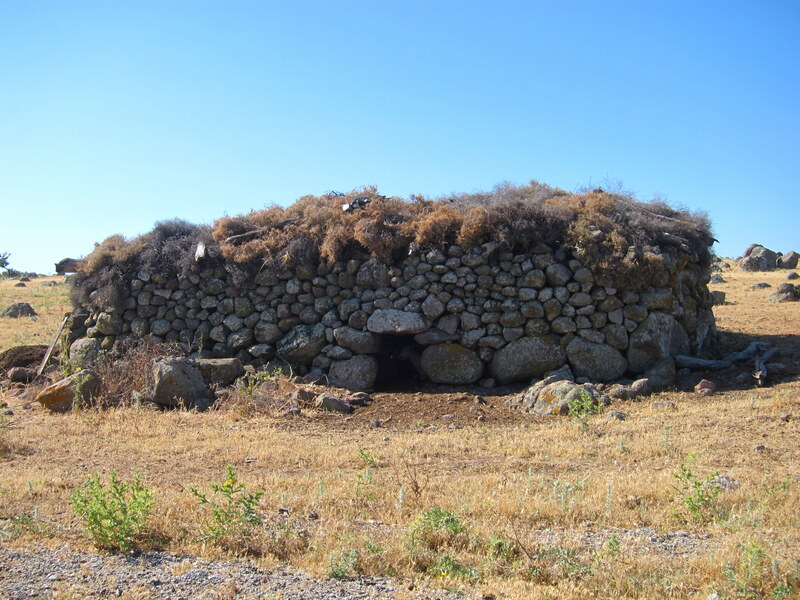 We did some research back in Turkey and found out that lodging in Lesvos was WAY outside our budget. We had about an hour of light after landing to find somewhere to sleep, preferably somewhere out of the way and cheap/free. It didn’t help that Manali(SP) was a densely populated port town. While on the ferry, we saw more open ground to the northeast of town and set that as our target. We bolted northwest blindly trusting the GPS, which took us on a bizarre and illogical tour of the steepest cobblestone streets in the entire town. I felt my chain tight and straining with the climb while even in the granniest of gears. I heard Jenny shifting up, up, up, and then a terrible crunch and silence. Her chain had blown up from the rough riding. I doubled back and fished in the repair kit for the other power link. I couldn’t find it and came up only with the spare nine speed chain. We looked at her chain and the pin that ripped out of the link. Aggravated and running out of light I salvaged the powerlink from her broken chain and slapped on the replacement. An old guy who owned the back street bakery we were in front of was clearly impressed with our preparedness and showed us the trash bin to throw the poor old chain that pulled Jenny’s bike across Asia with and after we were through, gave us repeated doses of dish soap to wash our grease stained hands off with under his spigot. At this point the sun was literally setting and we were still in a cobblestone alley, nowhere near anywhere to free camp. We cranked hard out of the port and sped along the semi-industrial outskirts of town. I saw a single paved road on the GPS which lead out to the ocean so we followed it, but it turned out to be some sort of waste water treatment facility which huge barbed wire fences keeping us on the pavement. 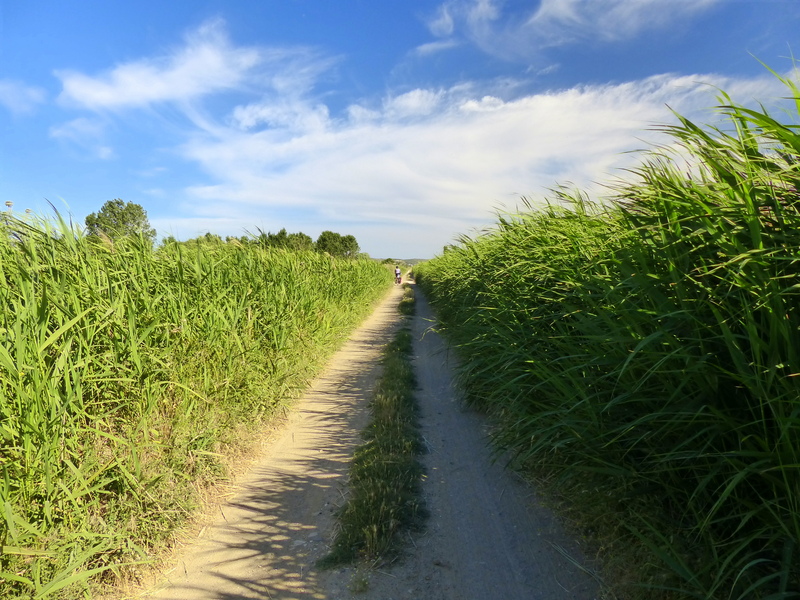 We turned around and saw a little side road which we followed. It turned out to be the local place to dump old parts of ruins. 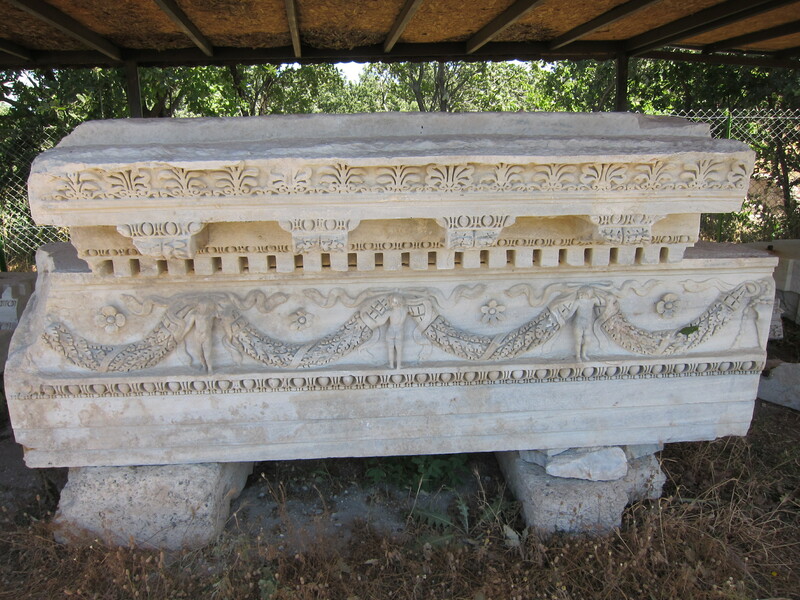 Tops of Greek columns and carved blocks were all stacked and numbered in the weeds in a clearing. We pushed the bikes along a sketchy path and found ourselves adjacent to an old mini traffic school training course which was all overgrown. We munched on bread and oil then waited until nightfall to pitch the tent, picked the aggressive hitchhikers out of our socks, watched the first two episodes of the new Arrested Development and fell asleep. Feeling refreshed, we woke up around 8 am, made our usual breakfast and coffee. We loaded up the bikes and then headed over to the restaurant to check email and double check our route. The night before, we decided that we were going to go to the Greek Island of Lesvos, which we actually could see off the coast of Turkey for the past couple of days. Our route through Turkey was made up on the fly and was in the opposite direction of where we were generally trying to go which is the Netherlands. 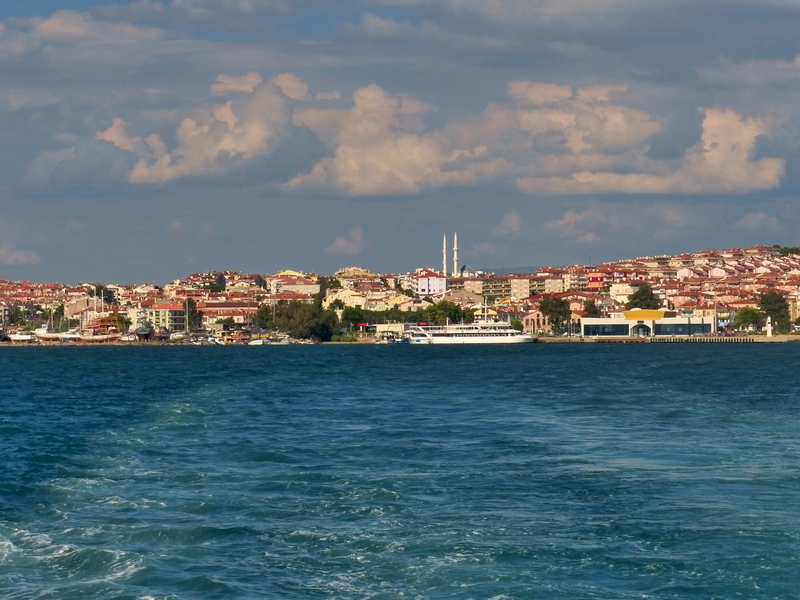 We saw there was a quick ferry hop over to Lesvos a few miles south in the city of Ayvalik . We also saw the sailing schedule was such that we would really have to hustle today to make the last boat. 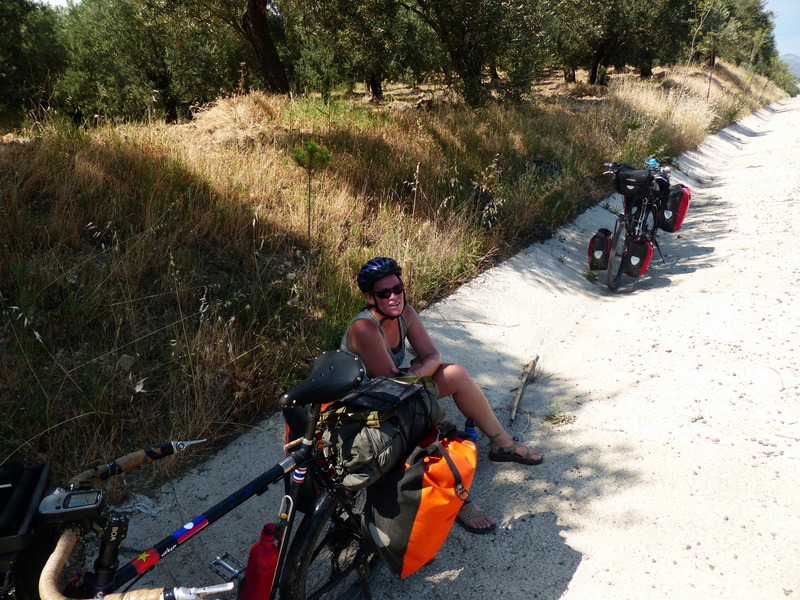 Since we were in such a nice spot we decided it wasn’t wise to ride hard to Ayvalik and potentially miss the boat and then have to find a hotel. We unloaded the bikes and put our tent back up much to the confusion of the campground staff. Jenny was working on the blog when I realized it was Wednesday, which is market day in Turkey. I rode into town and meandered around a while before I found a group of farmers selling cheese, eggs and produce. I bought cherries, a melon, peppers, potatoes, beans, garlic, onions, hard stinky cheese, weird shaped eggs (from chickens, confirmed after elaborate dances by both the buyer and seller), bread and some wine. The whole spread set us back less than $10. We swam in the ocean and dried off in the sun. A Turkish man who lived in Sweden chatted with us for a while and turned out to be a really nice guy. He was really concerned that we had to identify ourselves as Americans as we traveled around the world. We haven’t had a single awkward or bad experience with this so far (with the exception of a bizarre and harmless South African born woman of Afghan descent in our hostel in Istanbul who railed against Americans in the common area as “despicable imperialists”). We reassured him that in potentially sticky situations we just said we were from Alaska, which worked well enough. If pressed further we would say, “up north near Canada”, which tended to neutralize things. We chatted with some lovely German campers who had been coming to the site for 30 years. They were really sweet and assured us about the incredible quality of both the local air and the water. Around dark a large RV of American proportions rolled up. We weren’t really stoked by this big rig spoiling our quiet time. The inhabitants of the camper rolled out speaking to the campground owners in what sounded to us like Russian. Suddenly, two of them came over to us and started chatting. It turned out they were a group of young Latvians on vacation for two weeks in Turkey. They spoke great English and were really fun people. We ended up sharing a bottle of wine and talking with them past midnight about Latvia, Turkey, the EU, politics and all kinds of things. They were some of the most interesting and friendly people we have met on the whole trip. We went to sleep worn out and with a plan to make a leisurely ride to the ferry and then onto a new country! Greece here we come!! This morning we woke up with the sun. Being at the top of a hill, it came early and roused us earlier than usual. We cooked up a breakfast and packed away our camp. We have a tent, sleeping bags and inflatable mats that need to be broken down every day. Jenny has taken over those tasks while I boil water for coffee, slice up the potatoes, scramble the eggs and do the dishes. It takes us about an hour from waking up to getting on the road, which is actually not much of a difference than our “normal” life in Anchorage. We rode down, the hill staring us in the eye, and back up the other side. We ground our way past Assos, which had some pretty interesting ruins, but we were in the mood to put away some miles and rode on. 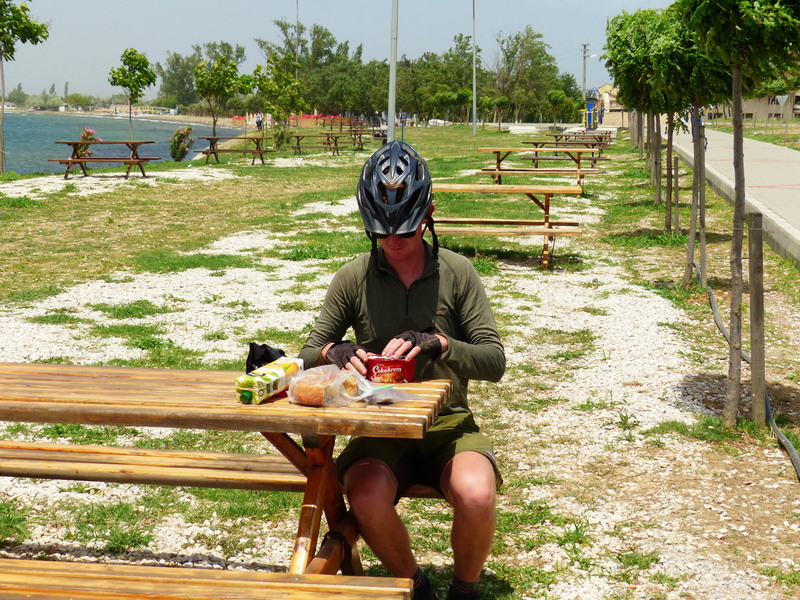 It was hot again, but we ended up riding near the coast, in the shelter of leafy trees. We took a break at a small roadside teahouse and bought some cold drinks. 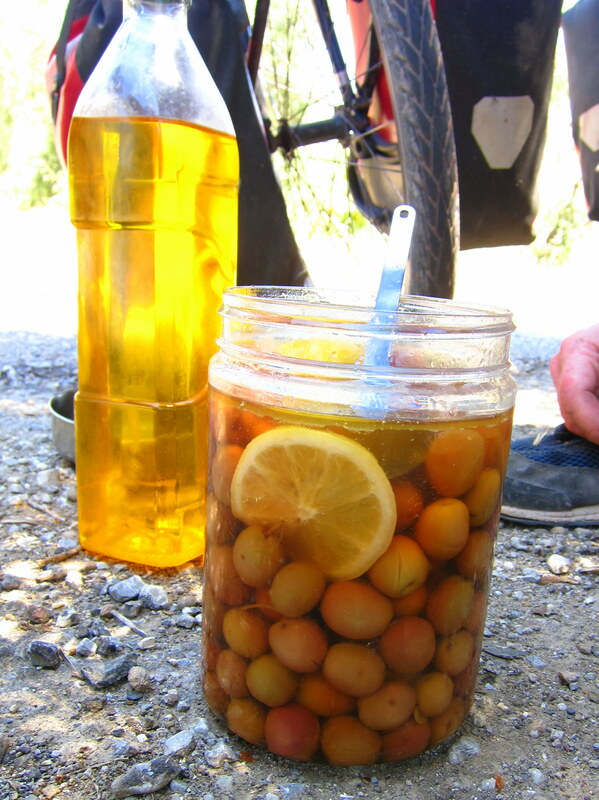 They also had a display of home jarred olives packed with slices of lemon and 1.5 liter bottles of homemade olive oil for sale. We bought some of both for $10 total. At this point we had descended to the coastline. There were tons of dilapidated campgrounds and dubious looking hotels that we cruised past. Soon enough we were in an awful retirement community, with stacks of identical beach homes climbing up the slopes. There was a pair of supermarkets which we sampled while lingering in the shade of their entrances. The produce was dismal, but we stocked up on cheap soft cheese, pasta and local wine. While we sat outside one of the markets waiting for the weather to change from “hot as hell” to “awesome for riding” (which it never did) we saw 3 car accidents in the parking lot, resulting from the oblivious but able geriatric demographic which dominated the town. We decided to book it clear and quickly found ourselves on some side roads. We put all our hopes and dreams into making it eventually to a campsite listed on our GPS (which had recently proven itself to be wildly unreliable). Luckily, this time, the Altin campground existed, and was more amazing than we could have imagined. For 12 Euros a night we had a nice flat spot to pitch the tent, a warm shower, bathrooms, a kitchen sink area, wifi, a café, a private sand bottomed beach in the Aegean and really nice owners who basically completely ignored us the entire time. We made a really nice dinner of roasted red peppers with eggplant and onion over pasta with soft creamy Turkish cheese that had a rough bite reminiscent of Roquefort. Probably technically a culinary disaster, but we loved it! 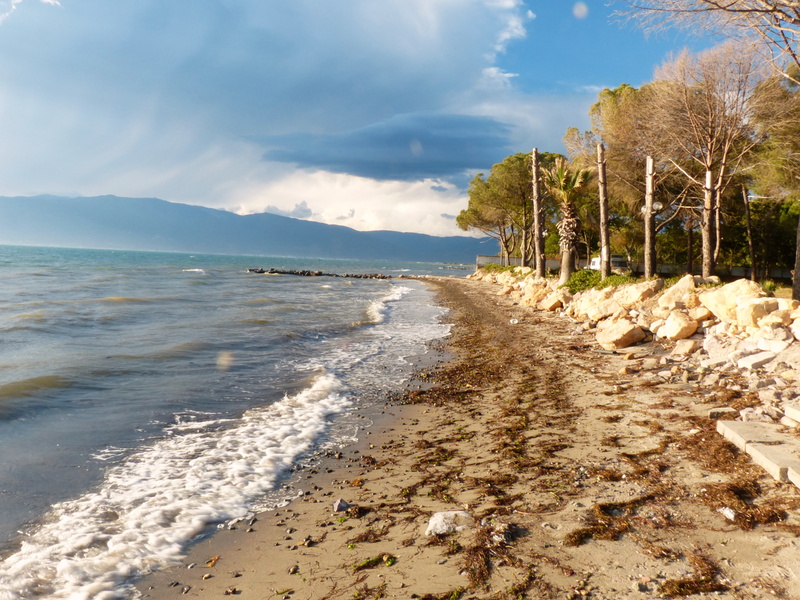 Filled up with carbs and a bottle or two of Turkish wine, we crashed to the soft sound of waves on the Aegean. We slept in the next day. Rest days are important for recovery, but just one day off the bikes makes us feel pretty lazy. We cooked up a breakfast of fried potatoes and eggs, and made some coffee. One thing about Turkey is the coffee situation isn’t great. In my head, Turkish coffee was some sort of legendary nirvana state of coffee. This is based solely on the fact that at Costco, when you grind the coffee in the giant machine near the hotdog stand, the only setting beyond espresso grind is “Turkish” which clearly meant that it was another 10 times or so more powerful than espresso. In reality, it tasted like burnt crap. There, it’s out there, the dream is over. We had settled into drinking instant Nescafe 3 in 1 which is just as awful as it sounds. We headed over to the restaurant, only to find it closed and totally abandoned. Luckily, the internet was still on, so we uploaded some more stuff, checked out the security situation and did some route research. Finally, at around noon we got on the bikes and started heading south. Our legs felt leaden, and progress was slow. After just a few miles we came across part of the ruins of Troa Alexandria. The place was fenced off, but there were some interpretive signs inside so I jumped the fence to explore a little while Jenny stood guard. Unfortunately, the archeological team was German, so the signs were just in Turkish and German, and I have no idea what was going on there. 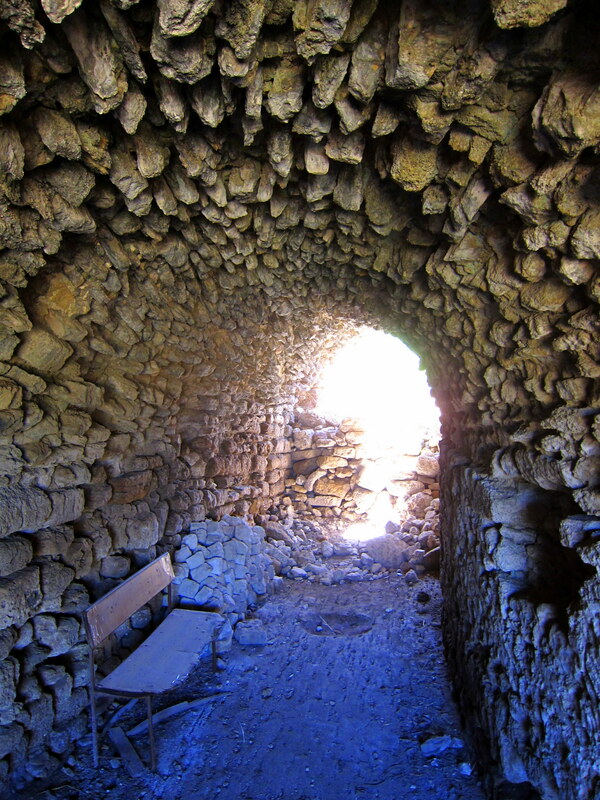 I did walk through a pretty cool masonry tunnel structure. Another few kilometers down the road I saw a column rising above the trees at least 10 meters high or so. As I rounded the bend I slammed on the brakes as I saw an intact stone arch rising out of the forest off on my left. It felt like a real “Indiana Jones” moment because we were in the middle of nowhere on a little country road and the arch was just off in the woods over there. 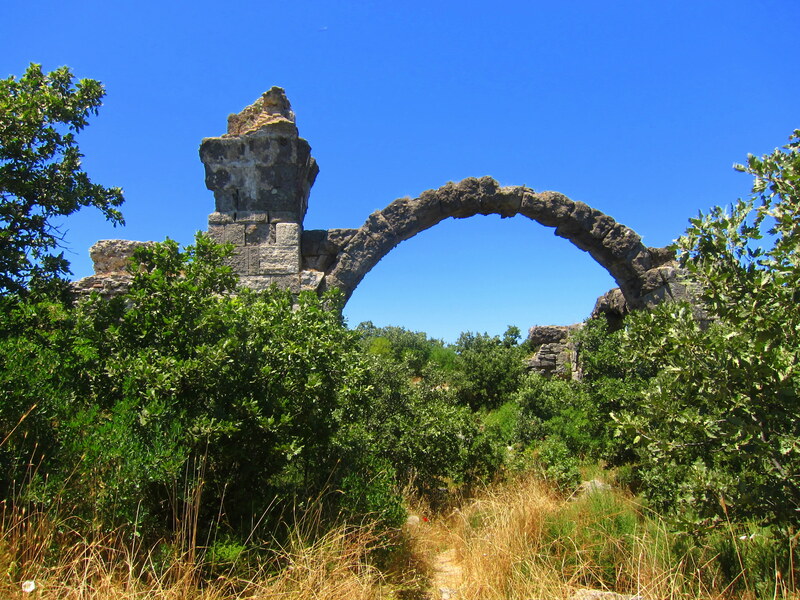 We got off the bikes and followed a little footpath which meandered past some other overgrown ruins. We finally got to the arch and found that there were actually three separate arches making up the sides of a square courtyard area. One of the arches was buttressed with a timber truss, but the other two were freestanding. It was amazing to see such massive and ancient structures intact, off in the woods, seemingly forgotten. 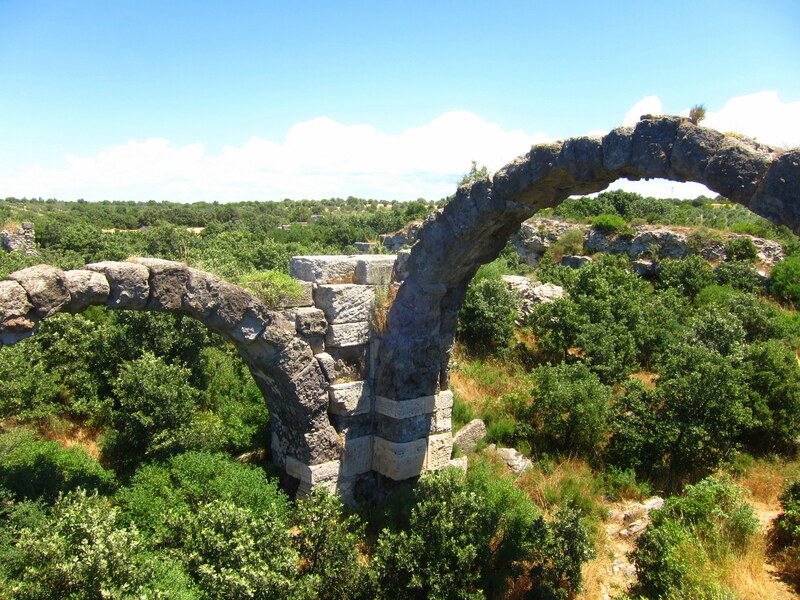 Some internet research after the fact indicated that the arches were part of the ruins of a gymnasium or bath structure. We cruised along for a while near the sea but unable to see it over some small hills obscuring the view. There wasn’t much traffic and the road was nice but it was hot. 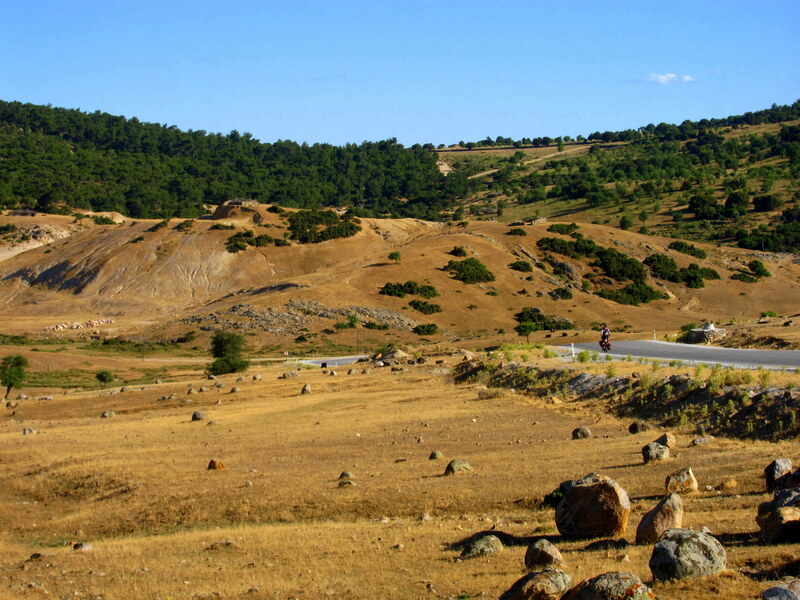 After a little while we hit a town called Tuzla and suddenly the landscape changed. 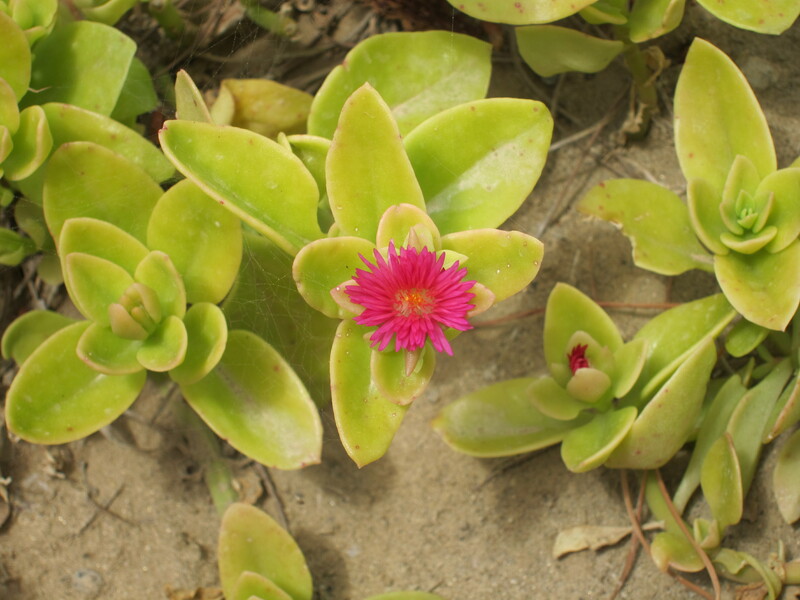 We went from stereotypical Mediterranean olive trees and ocean to something that seemed out of Arizona or Nevada. 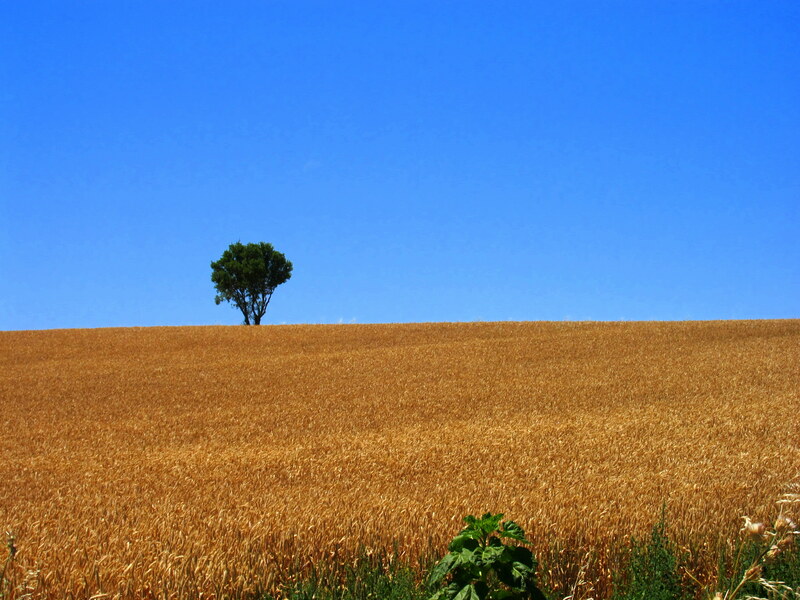 Hard, little shrubs grew on the mountain slopes although there were still well tended fields of hay and wheat. Iron, red water flowed from broken rocky slopes and the sun seemed even more intense for the almost complete lack of shade. We stopped for some ice cream and water before plodding along through some small towns where the only action was a gaggle of old men drinking tea at the café. Halfway up a big hill, my chain started to make a really bad noise, so I stopped to check it out. One of the pins holding the links together had come out so the side of its link was grinding on both derailleurs as it went around. I managed to press it all back together with a chain tool, but the link was damaged and kept binding as it went around the rear derailleur. On the steepest part of the climb it blew apart and my bike sprouted a tail as it shot the tired chain behind it into the gravel. Luckily, I was in some shade and could stop in place. I extracted the offending link and patched the chain together with a spare powerlink we had in our repair kit. With two major chain issues in the past week I was considering how wise it was to only have one spare chain with us. We continued along in the broiling sun, not unhappy but a little weary with so much climbing after the relatively easy past few days of riding. When we crested a hill an hour or so before sunset and looked down the long descent and even larger climb after it, I suggested we just stop for the day and regroup in the morning. 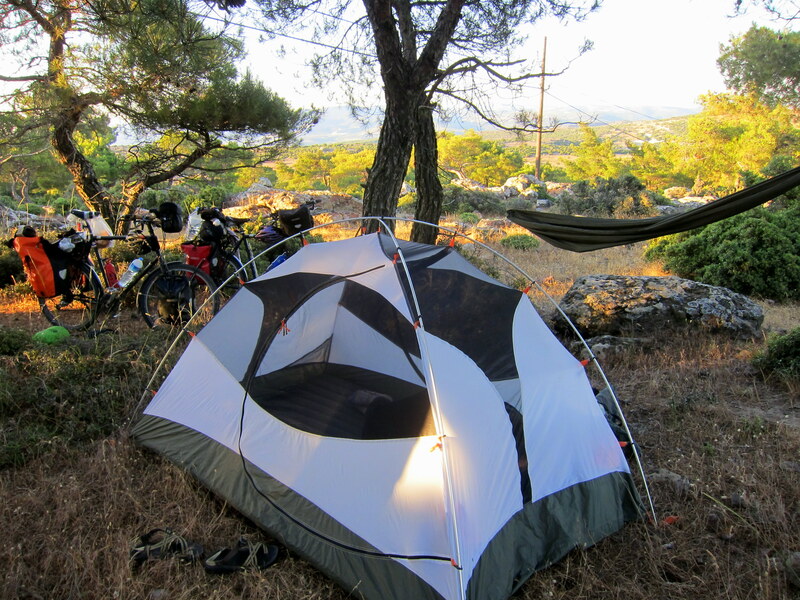 We were in a rocky highland area used to graze goats, but we happened to be by a small stand of pine trees which didn’t have any poop around, so we rolled our bikes in, set up the hammock and made ourselves a camp for the night. After a good night’s rest, we both popped out of the tent the moment the alarm went off. The days have been so hot that we have been trying to get up earlier, so that at least some of our riding takes place in the cooler hours. Our attempts don’t seem to be working too well though. About 10 minutes after finally getting on the bikes, we came across a man selling veggies out the back of his truck. We picked out green beans, potatoes, tomatoes and onions. I got about 5 pounds off fresh vegetables for less than $5. I love this country! Once fully loaded with produce, we were ready to go. Until we almost immediately saw a market and had to stop. We purchased fresh bread, juice, water and something for dessert. Now, we could finally hit the road. The road immediately headed straight up a big hill. We took it slow with lots of stops for water or juice. A young man in a dump truck actually offered me a ride up the hill by holding to his truck. I had to decline because I was too scared of what could possibly go wrong. 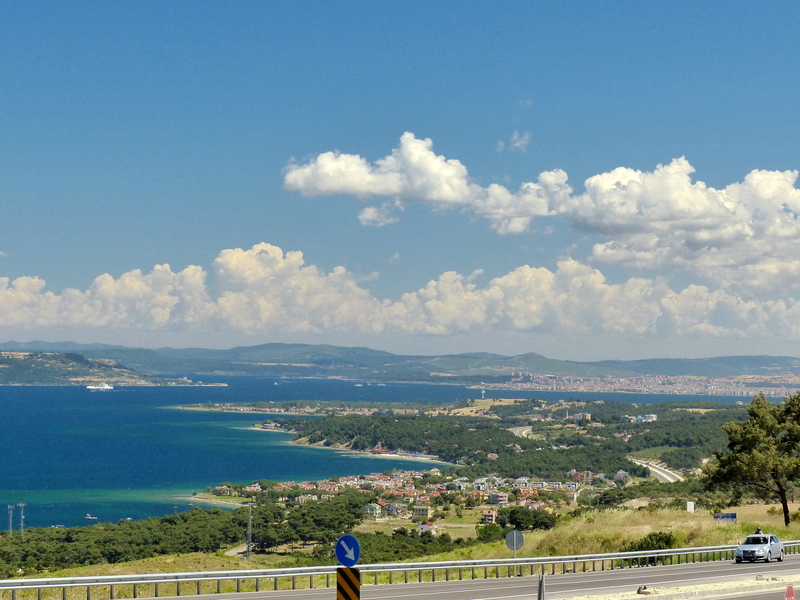 At the top of the hill, we were rewarded with an amazing view of the Dardanelles. The highway we had been traveling was wonderful with a huge shoulder, perfect pavement and polite drivers, but when the opportunity to get off the highway presented itself, we took it. 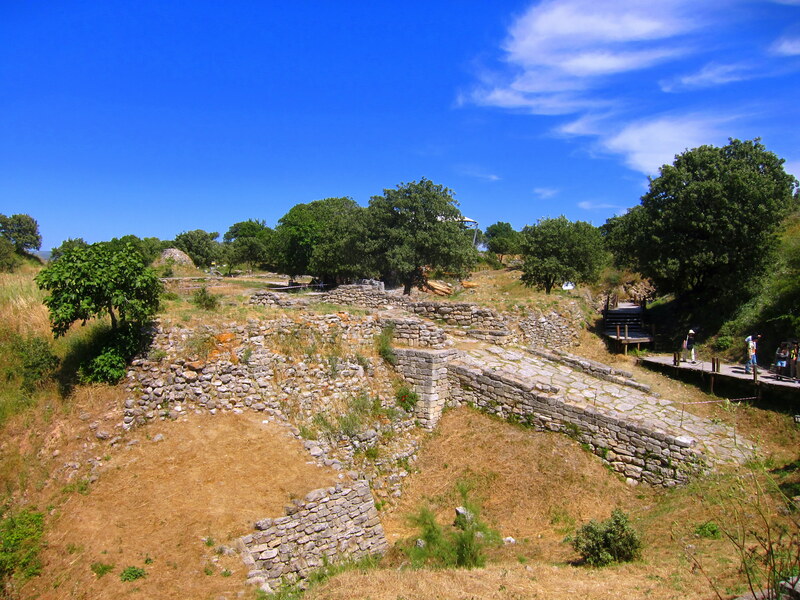 The smaller road we chose also took us near Truva, better known as the ancient city of Troy. Chandler and I both took Latin at in school and read the Iliad, so the chance to actually see this ancient city could not be missed. We paid 15 lira each for admission and parked our bikes by the guard station. It was pretty interesting, but nothing really stood out. The area had been extensively excavated over the years, initially by a treasure hunter type who apparently caused a lot of damage through his crude techniques. 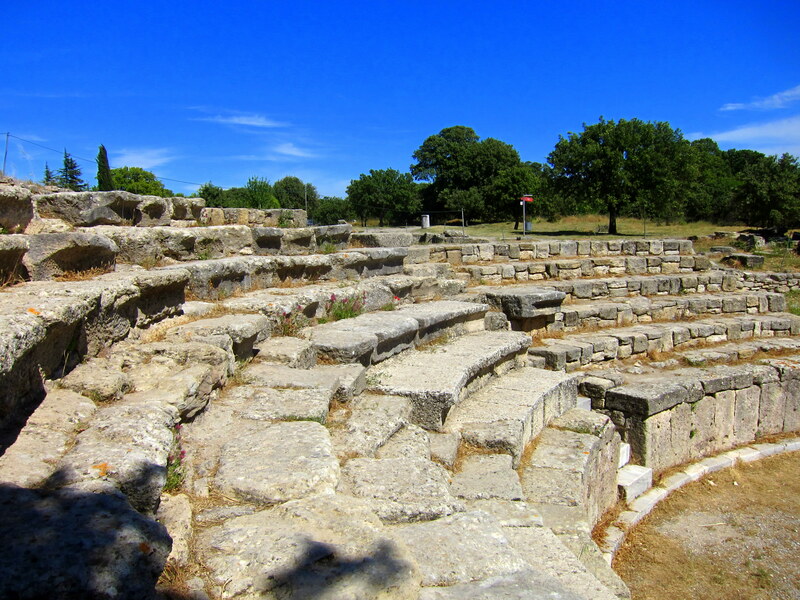 The main things to look at were random unearthed walls, wells and an amphitheatre. The ruins were not in the best condition, so it took some imagination to visualize what everything had looked like. What made things even more confusing was the city was inhabited over thousands of years, so there were actually several versions of Troy numbered Troy I through Troy IX or something, all on the same site. It was really difficult to keep straight what we were looking at and when it was from. 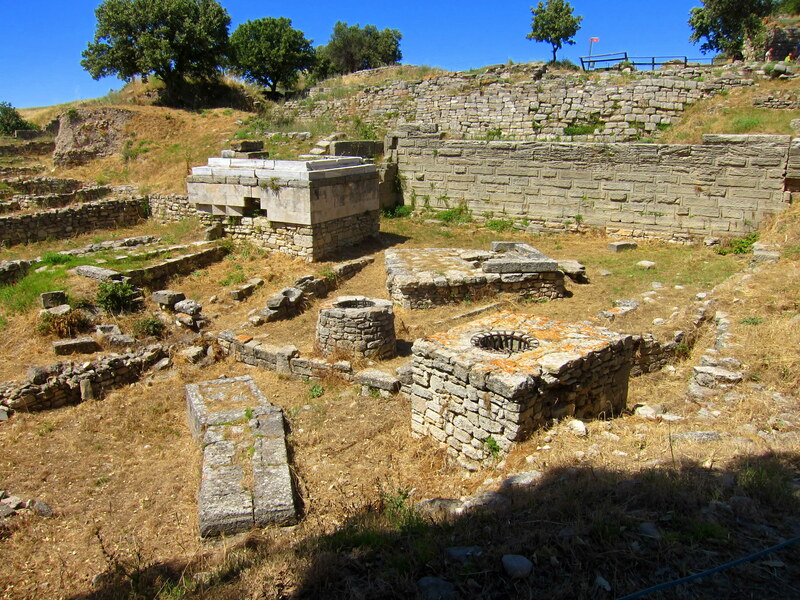 One of the more interesting pieces of trivia we learned was that Troy was a premiere tourist attraction for Romans who would sail over to see the ruins. There was a bustling tourist industry and lots of touts giving “tours” of fake ruins, as there was apparently even less to see back then. As I was looking at one of the sites, a girl got my attention by asking if we were biking. Chantelle and her friend Roxanne are teachers working in Istanbul for a year. 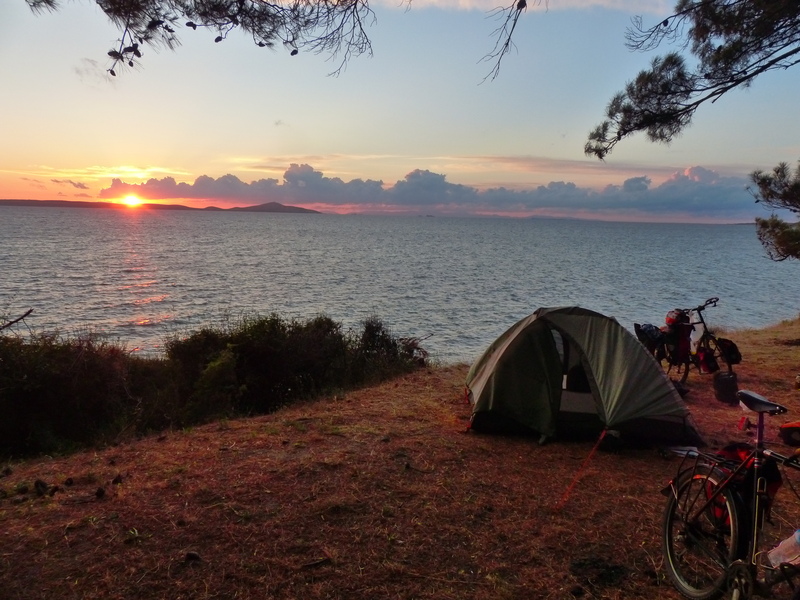 Chantelle had done a month long bike tour of the West Coast of the US and was contemplating bike touring in Turkey. It was awesome talking to someone familiar with the up and downs of traveling by bicycle. There were a number of campgrounds surrounding Troy which I would have been happy to stay at, but Chandler convinced me that we should put in a few more miles. Chandler had another campground picked out from the GPS that was 20 miles away, so off we went. We stuck to the back roads again, which turned into a bit of an off road adventure. We reached the campground about an hour before sunset and were greeted by several people smiling and waving. The campground also hosted a restaurant and we were immediately invited over for some tea by a family dining. The men ended up being a battalion commander and a captain with the local gendarme, which we gathered was a semi-military force that acted as law enforcement in the rural parts of the country that didn’t have local police. We had a nice time chatting about Turkey, history and traveling while watching the sunset. They gave us a brief overview of the military history relating to the action at Gallipoli during the “Great War” which was obviously a bit different than what we learned in school. They were disappointed that we hadn’t crossed over to visit the memorials and the museum, and we were too by the end of the conversation. We went back to our campsite and took in the sunset from our spot on a little cliff over the Aegean. It was a great ending to a nice day. We woke up in the middle of the night to the sound of big raindrops falling on our tent. We reflexively shot out of the tent and put on the rain fly which is really waterproof, but doesn’t vent well and makes the tent unbearably stuffy if it’s warmer than 50 degrees or so. We threw plastic bags over our leather saddles and made sure the stove was under the fly. Our bike panniers are completely water proof so they stayed on the bikes which were parked under a tree giving them some protection. We settled back in the tent and fell back asleep. When we woke up, it was still raining. We told ourselves it would let up in awhile and should probably go back to sleep for a little while. When the rain lessened, we got out of the tent for coffee and breakfast. Considering we had been riding for 6 days without a break, I convinced Chandler it was time for a rest day. He agreed under one condition: I had to catch up the blog by writing drafts for all the India posts. It sounded like a good deal to me. 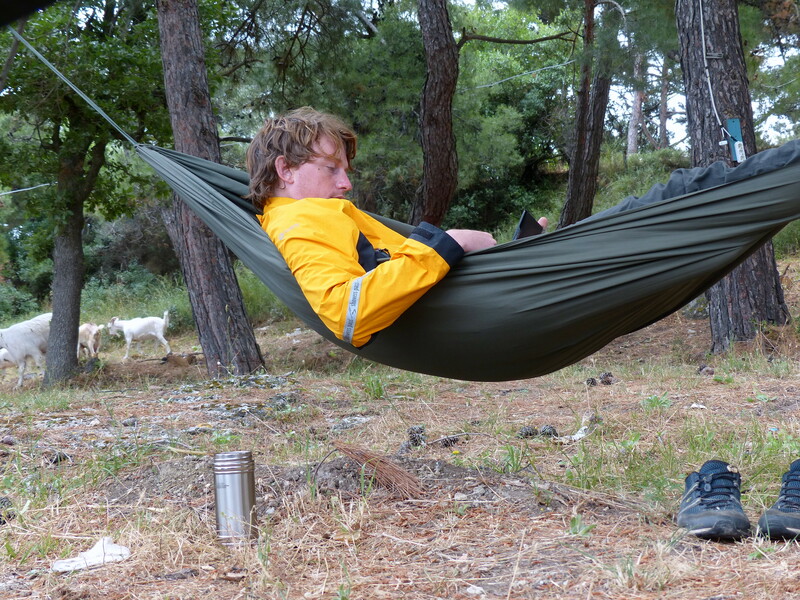 So, while Chandler rode to the nearest town and resupplied our kitchen, then relaxed in the hammock reading, I wrote 11 blog posts and edited a few pictures. That evening, we went to the restaurant for tea. 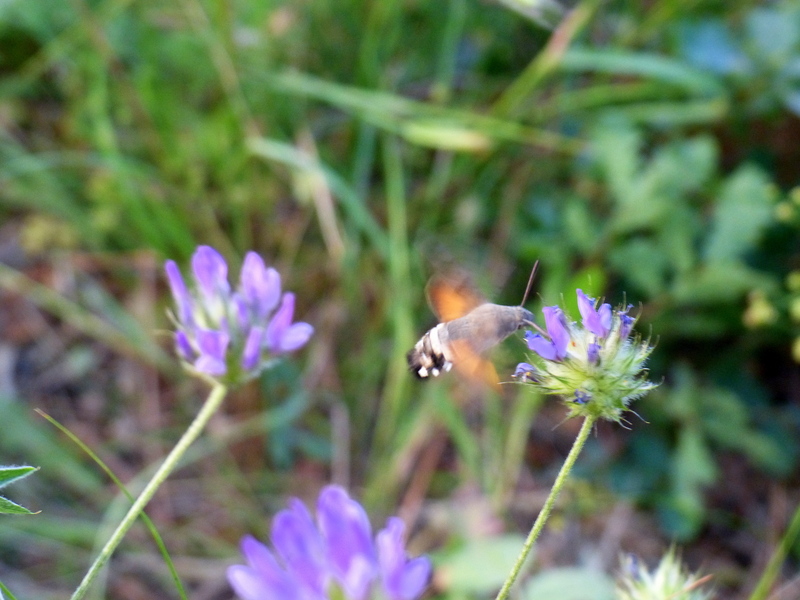 We found out that they had internet and uploaded a few posts to the blog. When Chandler checked his email, his inbox was flooded with concerned emails about our safety. We had no idea that the protest we had witnessed in Taksim Square had turned into nationwide protests and riots. We hadn’t seen a single sign of unrest in the past few days and were oblivious to developments. After a little research we found that the violence was pretty much isolated to the major cities of Istanbul, Ankara and Izmir. We had planned on leaving Turkey by ferry through Izmir so we started researching other options for departure. We registered ourselves online with the US Embassy in Ankara, and decided to just play things by ear. It was a little unsettling to hear that things were escalating, but considering that we hadn’t seen anyone protesting and that everything seemed “business as usual” we weren’t especially concerned. We went to bed after watching another spectacular sunset over the Aegean while cooking what had become our signature dish: stir fried veggies and local cheese over pasta with an extra large dose of olive oil! Amongst the cherry trees, we couldn’t tell if it was windy or not. We were hoping the fierce headwind we encountered yesterday would have died down. We ate our standard breakfast at this point, fried potatoes with scrambled eggs, cooked over our MSR Dragonfly stove, which runs on a number of fuels including gasoline. We filled up our liter bottle of 100 octane gas a few days before and have had no problems at all with the stove. It burns the gas really hot and doesn’t leave any soot on the cookware. We have been working out a technique to drain the gas from the fuel line, so when we disconnect it we don’t end up wasting gas and getting it everywhere. So long as we elevate the bottle the residual gasoline in the fuel line, it drains to the stove and burns off, making for a clean pack up. After we cooked and loaded up camp we rolled back down the asphalt. To our disappointment, the wind was there to greet us. We encountered a number of hills, but didn’t pay much attention to them. We have been loving Turkey so much that things have not been bugging us as much as it would have in Asia. I assume it is because we are much better fed here. When Chandler asked if I wanted to get off the highway and take back roads into the next town, even though that meant a big hill, I said no problem. Chandler wasn’t too far ahead of me when I noticed he had stopped. He was getting the camera out and staring at the middle of the road when I pulled up. 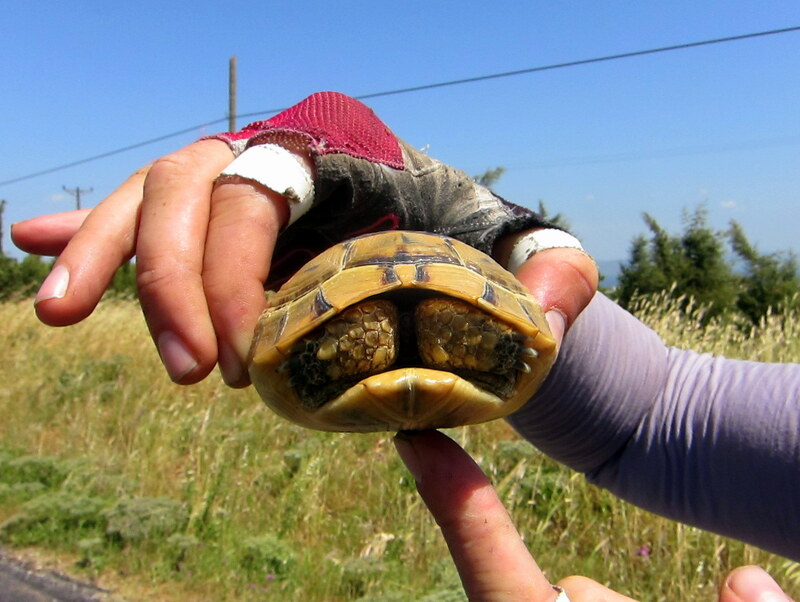 There was a little turtle trying to make his way across the road before a car came by and smashed him. Naturally, we had to rescue him. Poor turtle was not so keen on the idea, because he immediately pulled himself into his shell and didn’t come out even after moved to safety. After saving the turtle, the rest of our ride into town was very uneventful. We picked up groceries for the next couple of days and then went in search of the campground in the center of town. 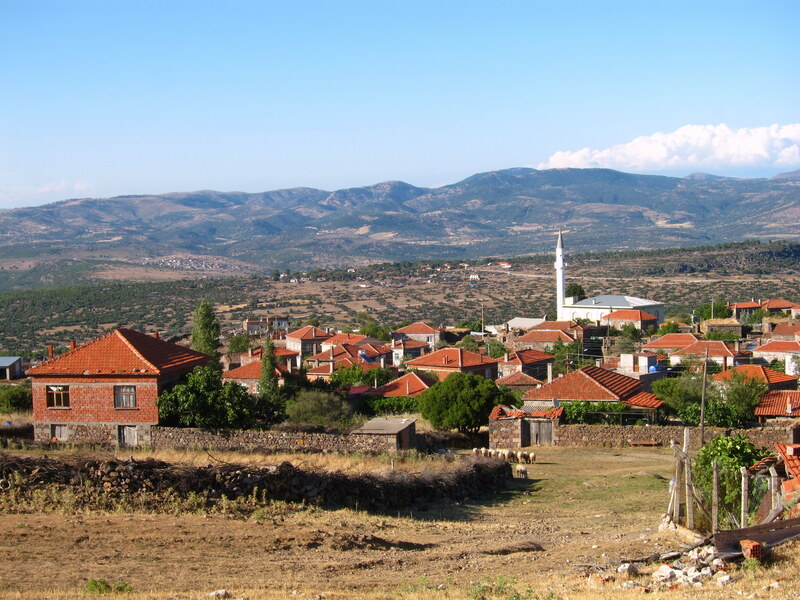 Turns out the GPS was a little wrong and the campground was nowhere to be found and we were in a busy part of the city of Canakkale. We headed to the coast to find another campground listed on the GPS. We are relying pretty heavily on the Garmin maps for Europe. There is internet around, but it isn’t as easy to find as on the road in the US, and since we are free camping, we either need to research a lot before we get to a region, or wing it. We tend to wing it. It was no big surprise when the campground we were riding to wasn’t actually there. We spent t a few minutes regrouping at a picnic area on the west side of the city, figuring out what we wanted to do. Without internet and very far from the tourist office, we decided to just keep biking out of town along the coast and hoped something would present itself. As we were getting into our stride, we noticed a campground, not on our GPS. The campground was right on the beach, and there were only a few caravans parked in it, so there was tons of space. 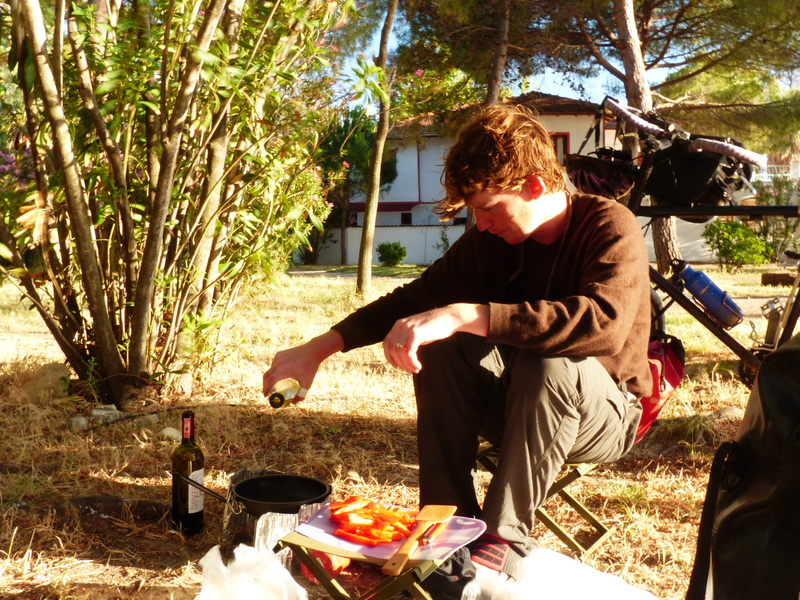 Chandler talked to the owners’ son and found out it was only 10 Euros to camp there, so we decided to stay. As Chandler was paying, I noticed three boys loitering around the beach, looking like they were going swimming. I said hello as they walked past me and asked if they had been swimming. Their only response was: “No, Danger, Danger!” I said goodbye and continued on to the beach and finally realized what the kids had been talking about. 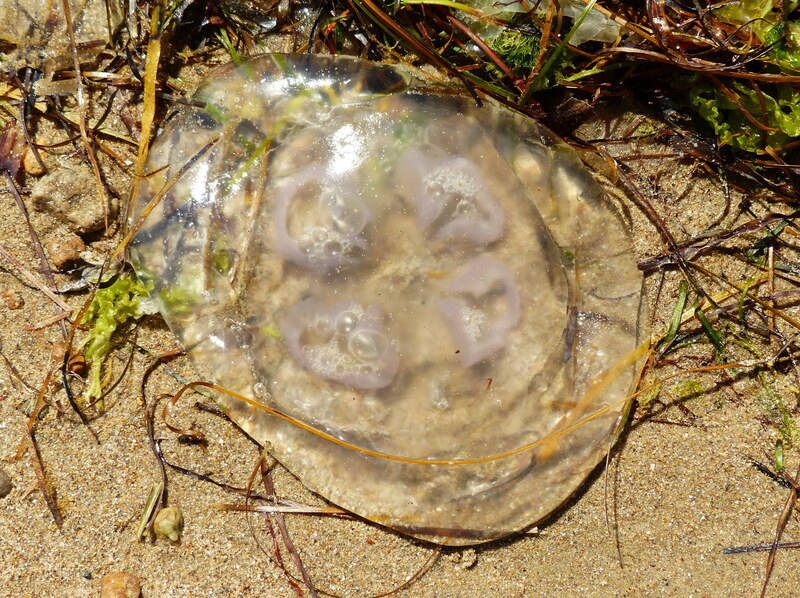 The beach was littered with jellyfish and the water was thick with them. No way was I swimming. 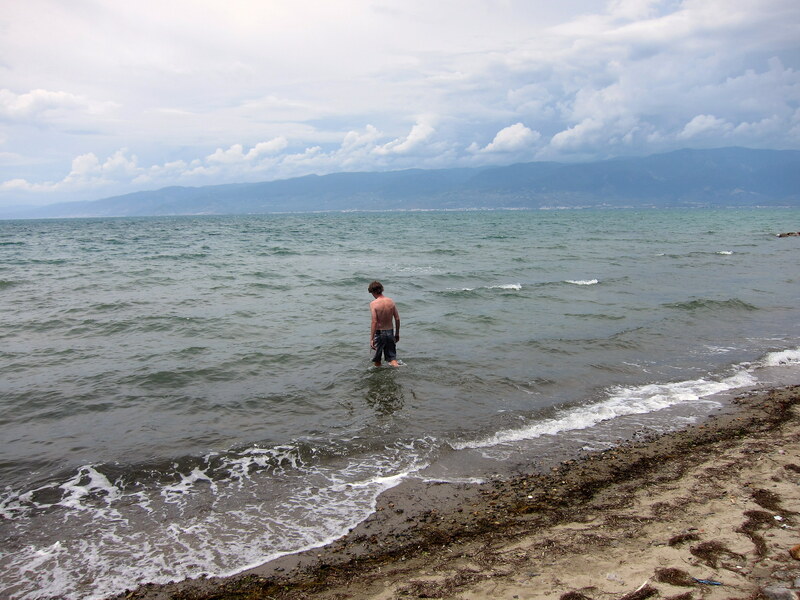 We enjoyed the beach, sipping on some beers in the lounge chairs, watching dolphins in the Dardanelles, feeling in quite the Club Med mode, when some younger boys rode up on bikes. They stripped down to their skivvies and walked into the water. Chandler and I were really confused at this point. Eventually the boys came over and asked us a few questions they knew in English. The conversation turned to swimming and then Chandler asking about the danger of the jellyfish in the water. To answer his question, one of the boys picked one of the blobs and threw it at his friend. Apparently, the jellyfish were not the stinging kind and a jelly battle ensued. Despite the fact that the jellyfish were harmless, the water was a bit cold and the beach was rocky so we took the weenie route and opted to not swim. We set up the hammock and I read for a while. Chandler went and helped some older ladies assemble a giant metal frame for a canopy tent, after their initial attempts appeared to be something out of a Laurel and Hardy movie. We cooked up a nice meal and slept to the sound of the gentle surf breaking on the beach. Another wonderful day in Turkey. The highway we have been traveling on is a cyclist’s dream. Smooth pavement, ample shoulder and courteous drivers. Construction areas are the best. The road is blocked for a kilometer before and after where the work is being done. That means we pretty much have the road to ourselves for stretches at a time. We spent the morning cruising along at a good speed, talking about living in Turkey. 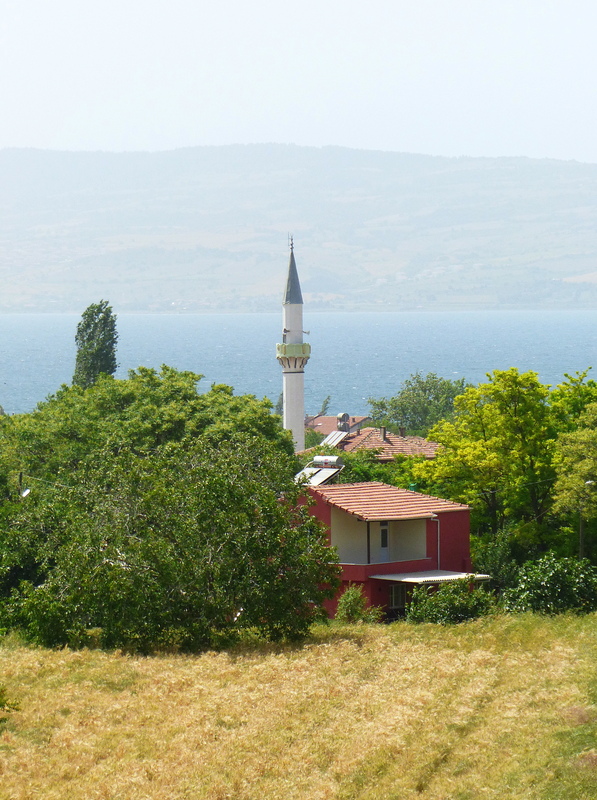 There were a few really nice old houses and cottages for sale along the way set in picturesque cherry orchards overlooking the Marmara. We would have a place on the beach and spend our days swimming and eating olives, cheese and bread. It was a wonderful daydream. Suddenly, we turned a corner and were up against a mighty headwind and our paced dropped by half. The wind was so strong, I could no longer feel the heat or notice the hills. We had to stop several times to rest or snack and curse. It’s hard going against the wind, which always makes us sing a certain song. 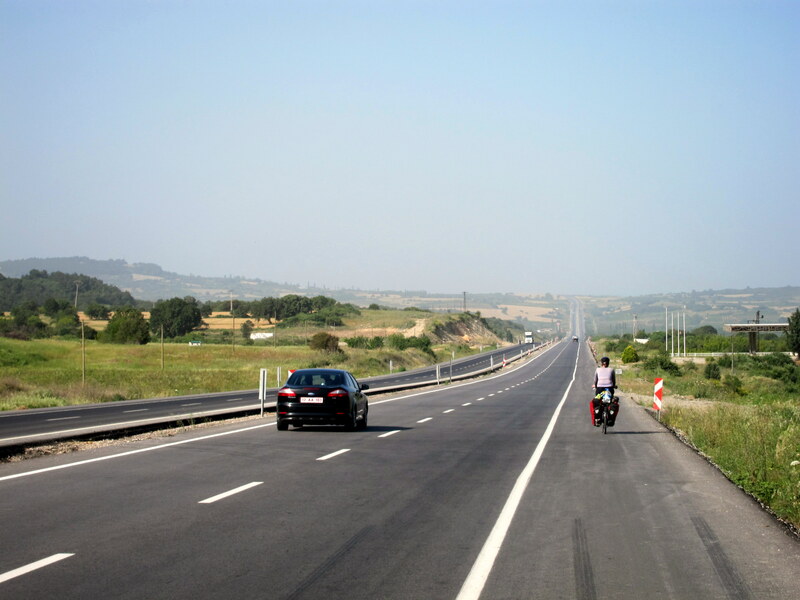 We still had 20 miles until Canakkale, but at our current speed it would take us another 4 hours. 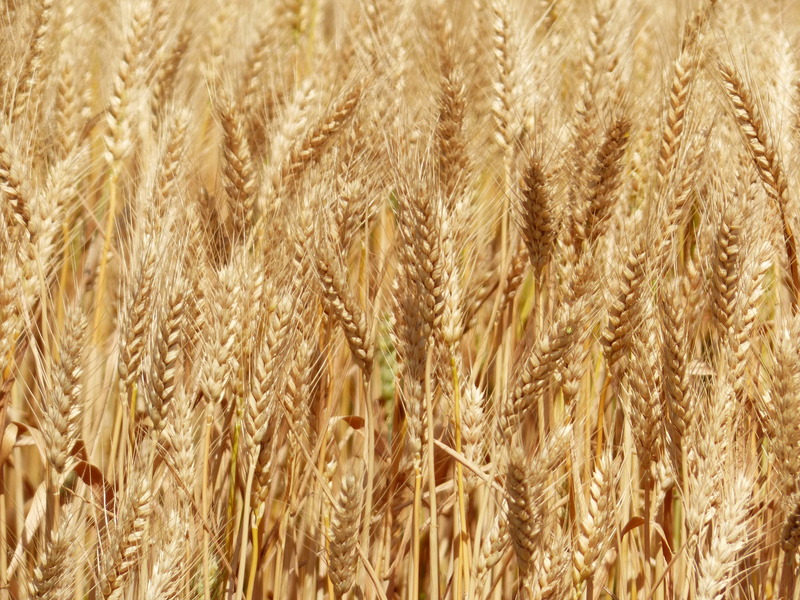 Chandler noticed a dirt path leading up into a wheat field and decided to check it out. He came back a few minutes later declaring he found us a spot. We waited until there was no traffic and then pushed our bikes up the path, which ended up being a service road for a cellphone tower. We rolled our bikes through the field and into a grove of trees. 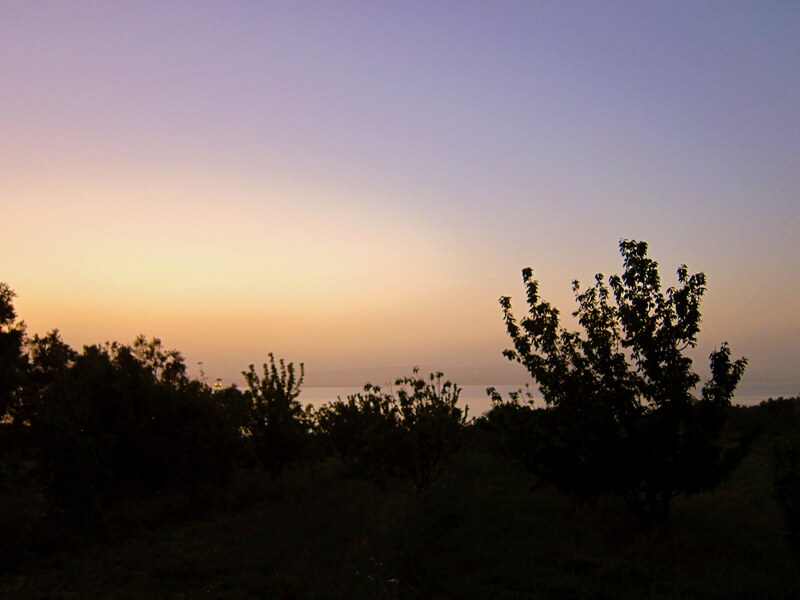 We were at the edge of a farm and cherry orchard with people working the land down at the bottom of the slope. We set up the hammock and got out our stools for reading until it got dark when we could set up the tent. Chandler had no problems, but I got really paranoid of people finding us. There was no reason why anyone would see us, but I was nervous about making the farmers angry. Chandler tried to alleviate my anxiety by pointing out that we weren’t damaging anything and were just camping on grass and weeds, not crops, so even if they did find us, they probably would let us stay. We relaxed for a few hours, but I couldn’t shake the feeling that we were going to get into trouble. As the sun was setting, I convinced Chandler to move our camp into the next field, where nobody was working. We were a little more exposed, but we were also surrounded by cherry trees! We had a glimpse of the sea through the straight rows of the trees. 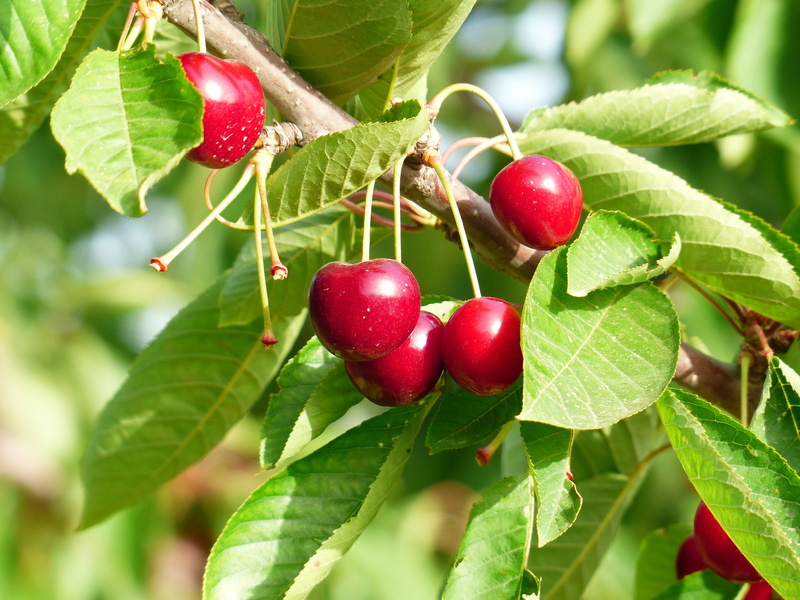 After our usual dinner of pasta, cheese and tomatoes we might have sampled a few cherries for dessert.